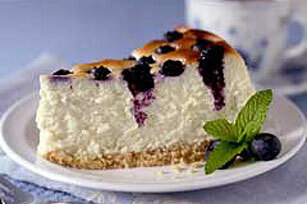 Blueberries and cheesecake and cookie crust—oh my! All this delectable dessert wizardry occurs with just 15 minutes of prep time. Preheat oven to 325°F if using a silver 9-inch springform pan (or to 300°F if using a dark nonstick 9-inch springform pan). Mix crumbs, 3 Tbsp. of the sugar and butter until well blended. Press firmly onto bottom of pan. Beat cream cheese, remaining 1 cup sugar, flour, vanilla and lemon peel with electric mixer on medium speed until well blended. Add sour cream; mix well. Add eggs, 1 at a time, beating on low speed after each addition just until blended. Pour over crust; top with 2 cups of the blueberries. Bake 1 hour 10 min. to 1 hour 15 min. or until center is almost set. Run small knife or spatula around rim of pan to loosen cake; cool before removing rim of pan. Refrigerate at least 4 hours before serving. Store leftover cheesecake in refrigerator. Garnish with additional blueberries and fresh mint sprigs just before serving. Substitute 1 bag (16 oz.) thawed frozen blueberries or 1 can (15 oz.) blueberries, well drained, for the 2 cups fresh blueberries.